Adorn your being with peace, health and radiance with a Japamala garland! 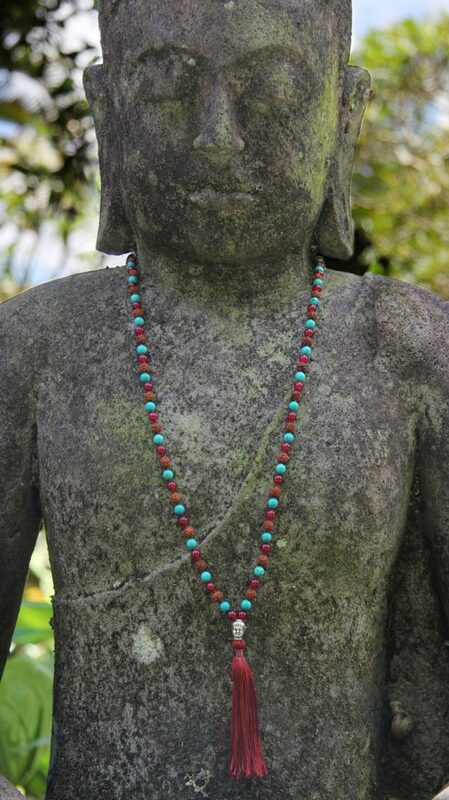 These 108 prayer beads are handmade with beautiful Green Turquoise and Red Onyx, semi precios stones and Rudrashka Seeds. Amethyst is a very powerful and stunning stone to wear. 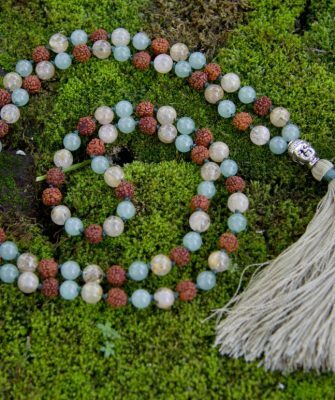 Combined with soothing Green Jade, makes the Mala a wonderful healing stone that will bring to the wearer harmony, prosperity and balance. Red Onyx is connected to the Moolha Dhara Chakra, which symbolizes stability and grounding. Rudraksha seeds are the original Vedic beads of power worn by the Rishis since times inmemorial on their path to enlightment. 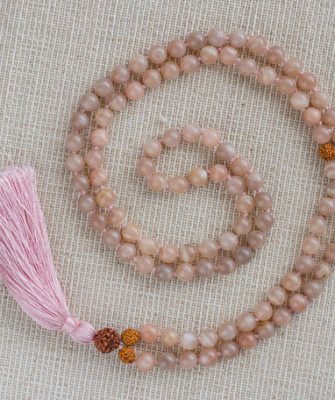 You can use the mala for praying, meditation or may be worn as jewelry as a constant reminder of your spiritual connection. Please wear them and hang them with care. 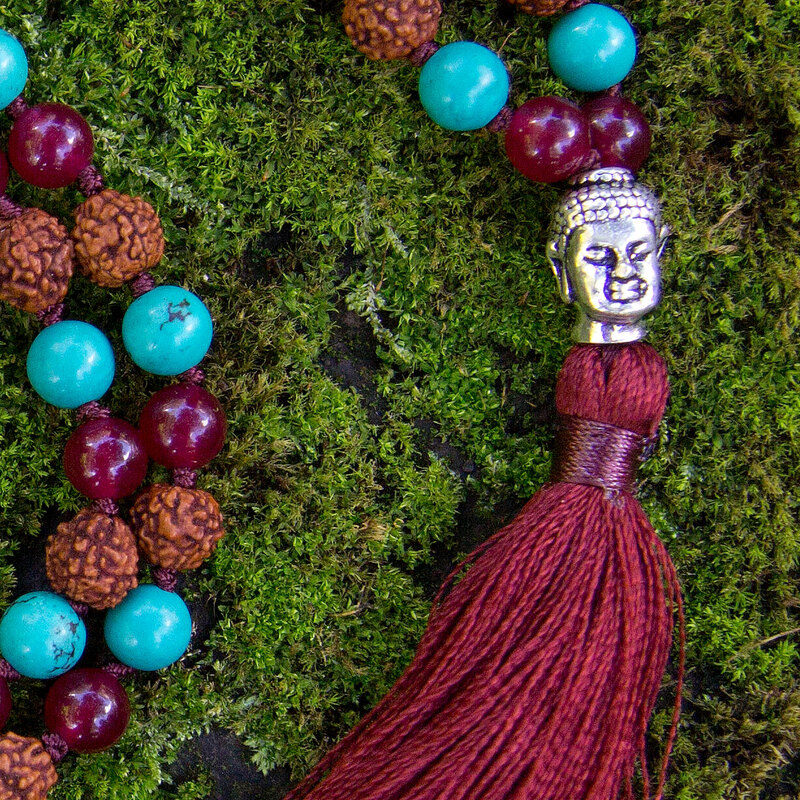 Our malas hope is to inspire people to live peaceful, happy and mindful lives! 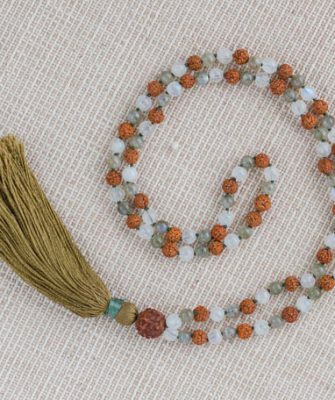 Adorn your being with peace, health and radiance with a Japa Mala garland! The Strength Mala has 108 prayer beads of beautiful Green Turquoise, Red Onyx and Rudraksha. 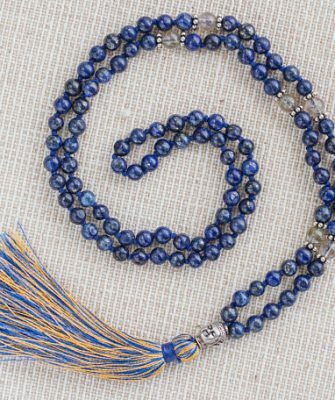 The total length of the Mala including the tassle is 50 cm (19.5″)) and excluding the tassle the length is 42 cm (16.5″). 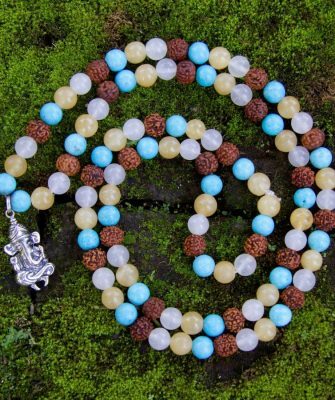 The Guru bead is a genuine silver sterling bead, showing a rare and sacred buddha head which will accompany you on your journey of awakening to peace of mind. Turquoise balances and aligns all the chakras, stabilising mood swings and instilling inner calm. Turquoise purifies lungs, soothes and clears sore throats. It’s also a stone of truth, which will give strength and purification. In particular Green Turquoise helps you clear any throat blockages and helps you find the strength to speak your truth. Red Onyx is connected to the Moolha Dhara Chakra, which symbolizes stability and grounding. Red Onyx will help you connect with your centre and to stand strong in difficult moments, reminding you of your power. Rudraksha seeds are the original Vedic beads of power worn by the Rishis since times immemorial on their path to enlightment. The Rudraksha tree is a large evergeen which grows in the foothills of the Himalayas and the central area of Nepal. Rudraksha seeds have always been worn for good health, awakening the Kundalini and help increase self love. Beautiful combination with Red Onyx to ground you in your centre, Green Turquoise to heal the spirit and clear any self expression blockages and Rudraksha to instill sacredness and self power.